This entry was posted in Around Pomona and tagged architecture, Pomona by David Allen. Bookmark the permalink. 1973: I was a junior at Cal Poly, living in my first apartment with two roommates. On my 21st birthday I went to Top Hat to buy liquor. I’m not sure I really wanted liquor, I just wanted to buy some legally. And the man at the counter didn’t even ask for my ID! I was so disappointed! 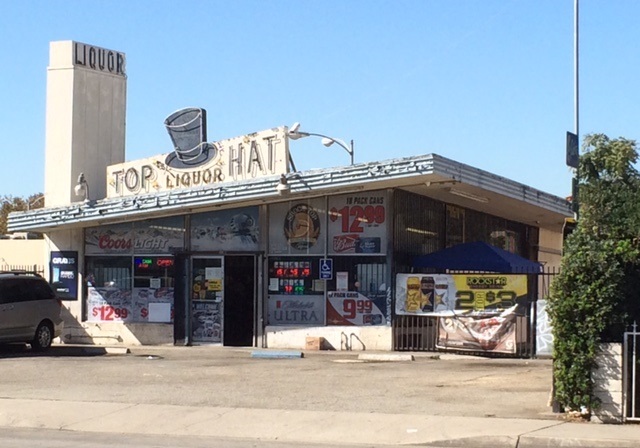 I believe there was, and perhaps still is, a Top Hat liquor in Glendora, in the shopping center at Grand and the 210 freeway. The center has been there since at least the mid 50s. Mayflower market was the anchor grocery store at one time.